Users of the Radeon RX 460 graphics card are in for a good news. Author of overclocking.guide, der8auer, has managed to unlock the Radeon RX 460, providing a free performance upgrade to users. The Radeon RX 460 is the only card available to desktop users that is based on the Polaris 11 GPU architecture. The card comprises 896 stream processors which deliver around 2 TFLOPs of compute performance. AMD has clocked this chip at 1090 MHz core and 1200 MHz boost clocks while the 2 GB GDDR5 model comes with a 128-but interface and clock speeds 7 GHz that deliver 112 GB/s bandwidth. 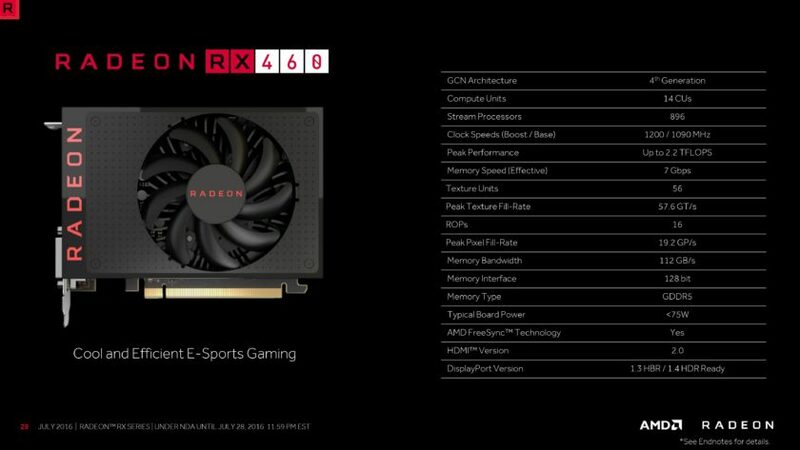 The RX 460 will also be available in 4 GB variants which will feature a higher price point than the 2 GB variants. 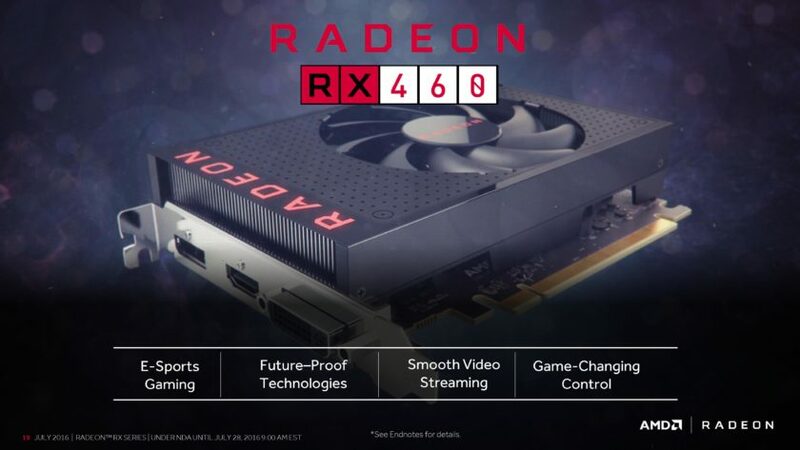 Since the card features the same GCN 4.0 architecture as its bigger brother, we will be getting up to 2.8x perf per watt improvement over past generation GCN products such as the Radeon R7 360. The Radeon RX 460 also comes with Display Port 1.3 / 1.4 HDR capabilities. With a simple firmware update, the card can be unlocked to gain more shaders. In the case of the RX 460, the stream processors jump from 896 to 1024. The Polaris 11 GPU actually comprises of 1024 stream processors arranged in 16 compute units. But the Radeon RX 460 had only 14 compute units enabled to allow for higher efficiency. Those who want higher performance would be delighted to hear this. The unlocked card gains you 128 more stream processors and also 8 additional TMUs. This results in a total of 64 TMUs and 1024 stream processors. The performance results speak for themselves as we the site reports improvements up to 12.5% which is a great increase. 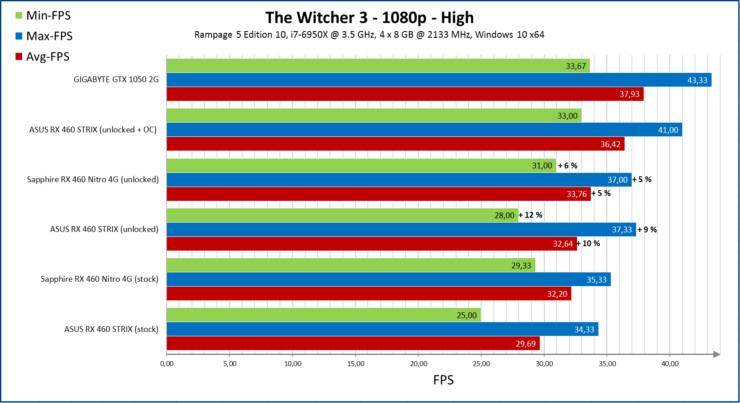 Of all the cards tested, the ASUS Radeon RX 460 STRIX gained 10% performance in Witcher 3 over the locked model. 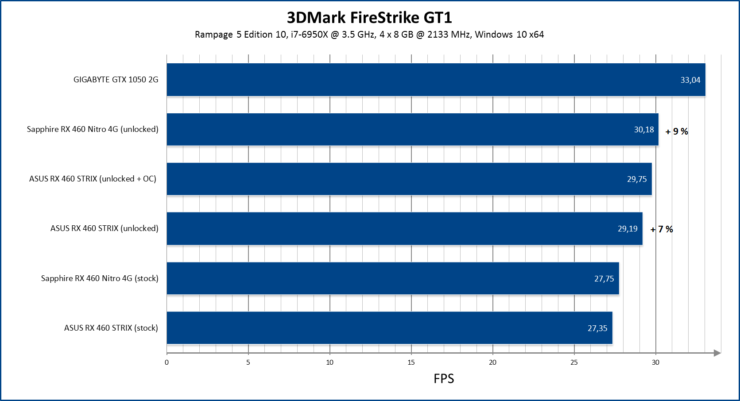 Similarly, 3DMark Firestrike tests yielded a 9% gain in performance. Overclocking.Guide reports that two models, specifically the ASUS RX 460 STRIX OC and Sapphire RX 460 Nitro OC can be unlocked without any issues. However, there’s always risk involved as mentioned by them. Note: It’s always possible that something goes wrong if you flash the BIOS of your card. In addition it’s possible that not all cards can be unlocked and that you might damage the card. Flash at your own risk! The download link for the BIOS firmware is provided below. You can also find it by heading to the source over here. First backup the original BIOS file in case you want to flash the card back at a certain point (run “backup bios.bat”). 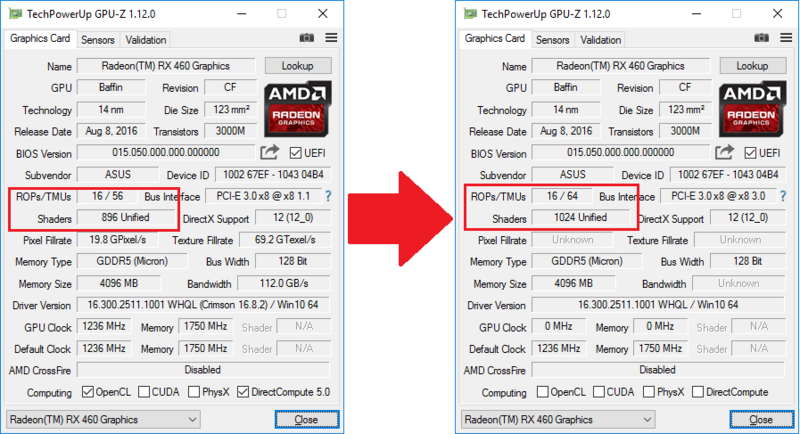 You can also save the BIOS with the latest version of TechPowerUp’s GPU-Z. Afterwards run “flash unlocked bios.bat” to flash the bios. It will take about 15 seconds and should look like in the picture below. The free performance upgrade is really great. Although there’s risk involved with flashing, graphics card today have decent firmware solutions to prevent any issue. 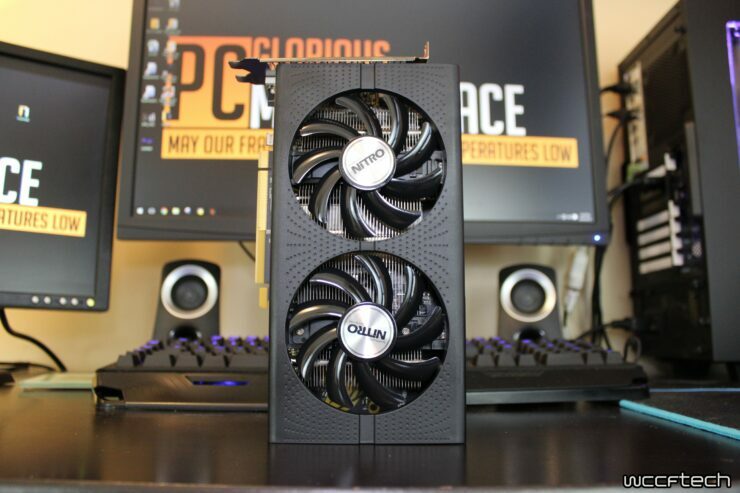 We tested the Radeon RX 460 Nitro OC in our review and found it as a decent card aimed at the entry level price point. Since unlocking the card is so simple, we wonder why AMD locked it in the first place. The reason could probably be related to Polaris 11 yields but with the 14 nm FinFET out in the market for sometime, we can see a full Polaris 11 offering from AMD soon.